Ottawa – Ottawa is the first Canadian city to launch testing of an on-street autonomous vehicle (AV) communicating with live City infrastructure. Until now, testing of AVs in Canada has been done in closed, segregated areas. By partnering with BlackBerry QNX and its Autonomous Vehicle Innovation Centre (AVIC), Ottawa now has the facilities and technology to further the advancement of driverless car testing on active public streets. Mayor Jim Watson celebrated this milestone with partners from BlackBerry QNX, Invest Ottawa, and the Kanata North Business Association as the car took its first spin around the Kanata North Technology Park. 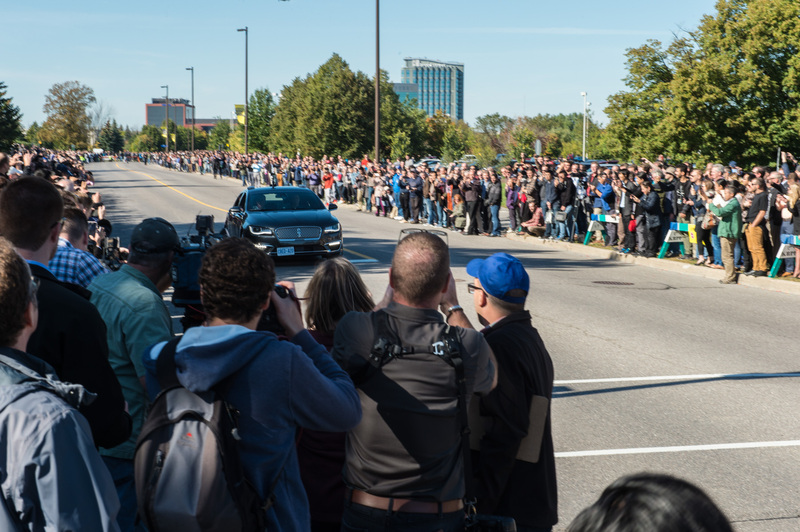 At the live demonstration, Mayor Jim Watson, Councillor Marianne Wilkinson and John Wall, Senior Vice President and GM of BlackBerry QNX, rode in BlackBerry’s autonomous drive concept car. During the ride, the car stopped at a traffic light at a pedestrian crossing, allowing people to cross the road. The test area, which loops around the Kanata North Technology Park, is equipped with the latest technology from BlackBerry QNX, along with Codha Wireless, Luxcom and NovAtel. The City’s Traffic Services have optimized the infrastructure within the test route area for communication with autonomous vehicles via Dedicated Short Range Communication (DSRC) transmitters at the traffic lights, re-painted street lines in the test area, and accelerated installation of controllable LED street lights. The City and BlackBerry QNX are working collaboratively with organizations such as Invest Ottawa and the Kanata North Business Association, as well as researchers and academics at Algonquin College, Carleton University and the University of Ottawa to further establish Ottawa as Canada’s AV capital. Together, these industry leaders will bring the emerging connected car and AV technologies, products, services and applications developed in Ottawa to the global market. This milestone in AV testing brings Ottawa a step closer to its vision of being a Centre of Excellence for Autonomous Vehicles, a highly competitive designation that will allow further advancement of driverless car testing. The City and Ottawa’s technology community are committed to working together to ensure that the testbed is continually being updated with leading-edge technology. In the next phase, Nokia will be joining the testbed to add LTE and 5G capability to the route, based on their experience deploying connected car solutions in Germany and elsewhere. There are over 70 companies in Ottawa’s autonomous vehicle ecosystem, led by BlackBerry QNX, that are directly contributing their expertise, technology and intelligence to connected cars and autonomous vehicles. BlackBerry QNX, a leading developer of mission-critical software that forms the foundation for connected and autonomous vehicles, will use the test route to further advance its software and technology development in this field. BlackBerry QNX’s operating system also powers the traffic management system used by the City’s Traffic Services. NovAtel’s GNSS GPS base station, installed on BlackBerry QNX’s building, and Codha’s DSRC technology, installed in the City traffic lights, can communicate directly with authorized AVs, and enable them to take appropriate action. In-kind contributions and donations of AV technology and systems from other leading industry partners including NovAtel and Codha Wireless. Critical funding and support from the City of Ottawa, Invest Ottawa, the lead economic development agency for the National Capital Region, and the Kanata North Business Association, which is home to Canada’s largest technology park. Ottawa is home to BlackBerry QNX’s Autonomous Vehicle Innovation Center. The BlackBerry QNX Autonomous Vehicle Innovation Centre (AVIC) was created to advance technology innovation for connected and autonomous vehicles, independently as well as in collaboration with private and public sector organizations and research institutes. Building on the company’s 20 years of experience and leadership in the automotive industry, the centre will germinate new ideas and transform innovative concepts into reality through advanced engineering projects and demonstration vehicles tested on real roads. Carleton Research has recently secured funding from the Canadian Safety and Security Program (CSSP). As part of the program, which is led by Defense Research and Development Canada’s Centre for Security Science and in partnership with Public Safety Canada, Carleton Research will be given $974,000 over three years for research on securing new connected and autonomous vehicles (CAVs). To help aid the University’s research, BlackBerry QNX has signed a charter with Carleton University to provide technical expertise in the area of automotive software development.